Automotive Reminder: Hey Tavarish or Doug, Are These Rare? Ford introduced the Explorer Sport Trac “Adrenalin” Concept back at the 2005 Detriot Auto Show. This Concept previewed the upcoming 2nd generation of the Sport Trac. Now what was funny is that 2 years before this Concept, we got the “Adrenalin” trim for the Sport Trac and it ushered in the models mid-cycle refresh. That model made all of 210 hp from a 4.0L V6 (which the only engine available for the entire model range) and weighed a measly two tons and some change. “What ‘bout dat torque, tho?” It was 252lb-ft. So this Concept was cool because it meant Ford was considering making the “Adrenalin” trim into something remotely more interesting than getting the last bit of toothpaste onto your brush. 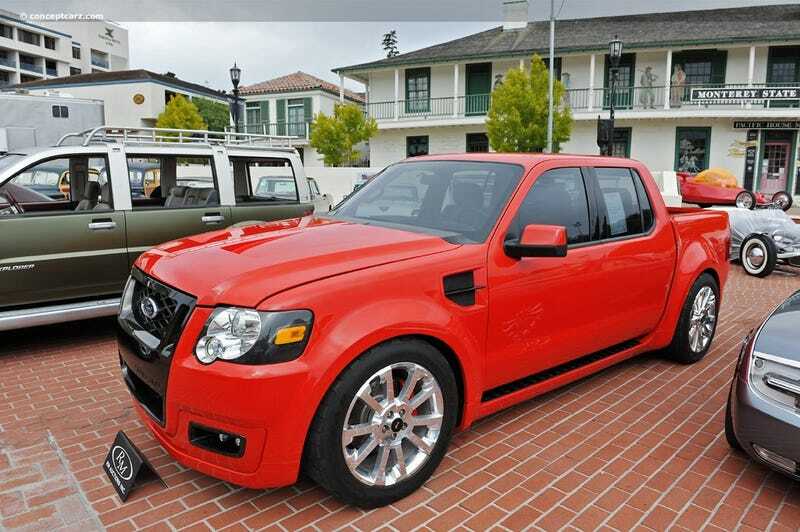 Ford did go through with the Concept promised, including the styling and the 4.6L V8 becoming an option (yes, option)! Except the SVT tuning and the supercharger. However, you still got a 295hp and 315lb-ft of torque truckish thing was now available for the 2007 MY and up Sport Tracs. Only about a 100hp loss over the concept, so not bad! My local Carmax has one of these 2008s with only 57k miles for sale for the low price of $24,998. I honestly think these things topped out at $32,000 brand new in 2007, so I don’t know what is going on here. *Edit: I just checked nationwide on Cargurus and there are 8 of these V8 equipped Sport Trac Adrenalins on there. They are all 2008 MYs. Did Ford only offer the V8 and Adrenalin Package for one year?! The stealthiest Future Classic of all times?! !